The Icarus Technique is based on the principle that when a wax-based drawing medium is exposed to heat, it becomes softer or even melts. When returned to room temperature, it quickly solidifies. The Icarus boards are designed for all wax-based drawing media, particularly colored pencils, artist crayons, and oil pastels. Any drawing style like photorealism, impressionisitc, or abstract can be achieved on the Icarus boards. Artists continuously find unique and creative ways of using the boards depending on their preference, level of expertise, medium, surface and so on. There are so many variables it would be impossible for us to list them all. The Icarus Boards are just a tool; they won't teach you how to draw but they will add a new and exciting dimension to your drawing experience. The Icarus Drawing Board is a portable drawing board featuring two working zones, a WARM ZONE and a COOL ZONE. The paper (or other support material) is placed on top of the board and moved freely from one zone to the other and back as necessary. The artist can rest his/her arms on the cool areas of the board. By shifting the artwork between the two zones, the artist can take full advantage of the intrinsic properties of wax-based drawing media. In general, the warm zone is used for mixing pigments, blending, burnishing and reworking. 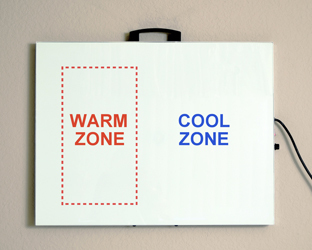 The cool zone is used for line drawing, detailing and finishing touches. 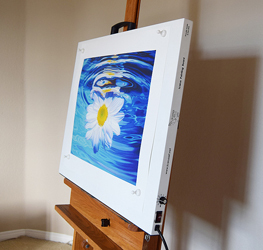 While the Icarus Drawing Board is mostly used horizontally on a desk, it can also work vertically on an easel with the paper taped to the glass. It comes in two sizes: 14”x 20” (Mod.1420) and 20”x 26” (Mod.2026). The choice of the right size depends on to average size of your artwork. Please remember than you can produce artwork much bigger than the size of board itself. For more information, please check the Icarus Drawing Board FAQ page. The Icarus Painting Board is a portable board designed to be used vertically on a regular easel (or a table easel) or horizontally on a desk. It features one large WARM ZONE and a strap in the back to secure it to the easel. If used horizontally, four rubber feet will keep it slightly elevated from the desk. 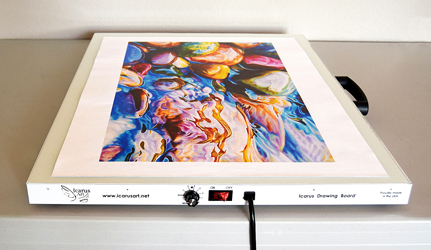 The paper (or other support material) is held in place by powerful neodymium magnets (included) that enable the artist to move the artwork or rotate it freely.With the power ON and the dial set at a desired temperature, the board is used for warm techniques (mixing pigments, blending, burnishing and reworking). With the power OFF and the surface at room temperature, the board is used for cool techniques (line drawing, detailing and finishing touches). It comes in one size: 22” x 28” (Mod. 2228). If you work on a desk, the Icarus Drawing Board is your best choice; if you like to work mostly on an easel, then the Icarus Painting Board is more appropriate. Both units can operate horizontally or vertically; however, the Icarus Painting Board has additional features that makes it ideal for table easels or standing easels. For more step-by-steps visit Ester's blog. For more step-by-steps, visit Ester's blog.